Tomorrow is time to give! Get in the spirit of "holigay" giving with our first-ever QTBLGiving Tuesday event on 11/28. Donate to these local LGBTQ-led organizations doing great work across our region. And think nationally by helping the LGBT community in Puerto Rico rebuild after the devastation of Hurricane Maria. The New Hampshire Community Loan Fund is a statewide nonprofit organization that provides the financing and support that low- and moderate-income people, families, and communities need to attain affordable homes, quality jobs, and child care, and become financially independent. Its loans help convert manufactured-home (mobile home) parks to resident-owned cooperatives, provide real mortgages for manufactured homes, grow job-creating small businesses, create affordable rental housing, and strengthen child care providers and community nonprofits. The funds it lends are invested in the Community Loan Fund by people and institutions that want to put their money to work right here in New Hampshire. More information at www.communityloanfund.org. Our readers say: "This 30+ year nonprofit provides opportunity to NH people who are otherwise denied the opportunity to create their own destiny. This organization is beyond LGBTQ friendly." Make a secure donation online here. New Heights creates "fun, energizing experiential learning opportunities for youth in grades 5–12." And the programs they offer are clearly fun: adventure-based programs like rock climbing and surfing as well as arts and STEM programs that focus on everything from robotics to cooking and even stilt walking! But what makes New Heights unique is a focus on providing "serious learning in seriously fun environments" and offering youth potentially life-changing opportunities to try something new in a supportive yet challenging setting. Make a secure donation online at donate.newheightsonline.org. Patrick Dorow Productions (PDP) aims to produce exceptional musical theatre in the greater Seaocast area, cultivating talent in all aspects of performing arts. Participants benefit from a confidence-building environment that cultivates performance skills alongside teamwork, trust, and conflict resolution. But program participants are not the only ones who benefit from this organization, as anyone who has seen one of their high-quality musical theatre productions can attest! A true community-focused organization, PDP even helps raise money for other community groups through their generous Community Focus program. Make a one-time or recurring donation online here. The only organization in the area focused on LGBTQA+ youth, Seacoast Outright has been providing safe spaces for youth in the Seacoast and beyond since 1993. 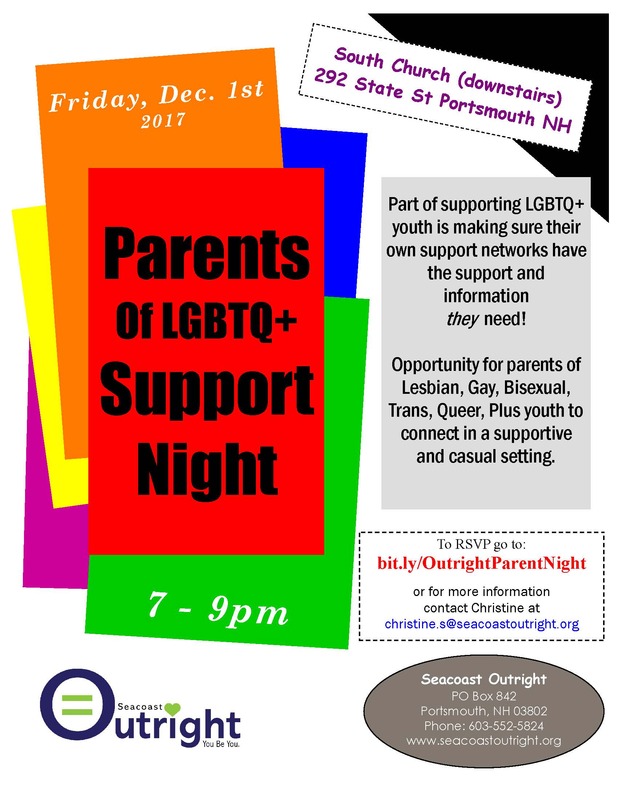 They also host the annual Portsmouth PRIDE event (with this year's being the biggest yet) and are currently raising money to support a new Education Outreach initiative in 2018. The Rochester Museum of Fine Arts is the city's foremost visual arts initiative focused on the presentation and accessibility of fine art. A unique volunteer-based organization, they curate exhibitions at the Rochester Community Center, the Rochester Public Library, and Rochester City Hall. The Rochester MFA also puts on the annual Rochester Gay Pride celebration. Our readers say: "The Rochester MFA not only brings art to downtown Rochester, they also host the annual Rochester Gay Pride event, which is a wonderful celebration of community. It makes me so happy each year to see downtown decked out in rainbow flags and even the Rochester Police officers wearing special rainbow patches for the occasion!" Contact Matt Wyatt (matt@rochestermfa.org) with any questions. Freedom New Hampshire is a nonpartisan coalition working to educate people about what it means to be transgender and the unique hardships that transgender people face—and to grow support for legislation (#TransBillNH) to explicitly protect transgender Granite Staters from discrimination under the law. As part of this ongoing effort, Freedom NH has collected stories from transgender folks across the state. You can read the stories (and share your own!) here. Email Freedom NH organizer Linds Jakows (linds@freedomnewhampshire.org) with any questions or to let them know you've made a donation! 3. ...or just keep shopping! Learn more about how they invest in Granite State women and donate to NHWF now. Our readers say: "Under excellent musical direction, the Gay Men's Chorus gives concerts featuring a wide variety of music in cities and towns around the state. They always draw big audiences and give to their fans 110%. They're one of the state's finest artistic resources." Did we miss your favorite LGBTQ-led organization? Fill out this super-quick form right now so we can make sure to include them in next year's QTBLGiving Tuesday guide. Boston Pride is partnering with Waves Ahead, an organization supporting Puerto Rico's vulnerable and marginalized communities, to provide relief to LGBT folks still struggling to recover from September's major storm. Learn more about the campaign and make a donation here. Based in New Hampshire's Seacoast area, THE OUTBOARD is a biweekly e-newsletter of local LGBTQ events and resources. We aim to build an intergenerational and inclusive community by connecting queer + bi + gay + trans + lesbian folks and friends around the Seacoast and beyond. Sign up for our free email list here. Did we miss your favorite LGBTQ-led organization? Fill out this super-quick form right now so we can include them in next year's QTBLGiving Tuesday guide.